Wholesale inventories plunged 5% in the Census Bureau Wholesale Trade Report for February, released today. 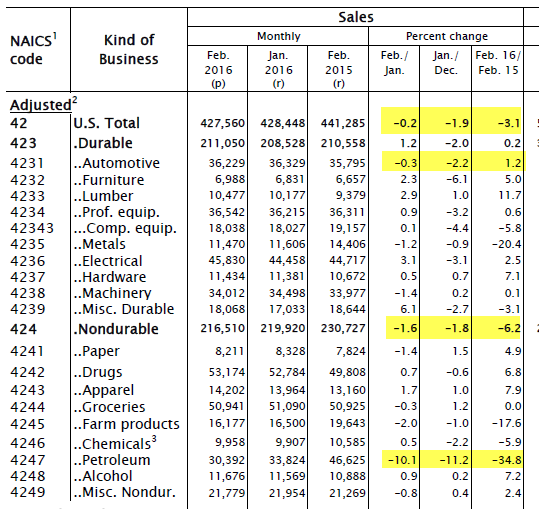 From the perspective of the original January report, wholesale inventories were down 1%. That’s a crash. The Bloomberg Econoday wholesale consensus estimate for inventories was -0.2% in a range of -0.6% to +0.4%. I congratulate the economist who was actually thinking, while wondering which one predicted +0.4%. Wholesalers aggressively drew down their inventories in February, 0.5 percent lower following a revised 0.2 percent draw in January. Auto inventories were worked sharply lower in February, down 1.0 percent for the largest monthly decline since September 2013. Sales in the wholesale sector fell 0.2 percent in the month for a 4th straight decline in a string that offers clear evidence of economic weakness. Yet the decline for inventories was greater than that for sales, making for an improvement in the stock-to-sales ratio which fell to a less heavy 1.36 from 1.37. Auto sales have been struggling this year and the decline in wholesale auto inventories could be an early sign of correction for this industry. Still, draws are always welcome news when demand is soft. Note that today’s inventory decline and downward revision are negatives for first-quarter GDP estimates. Wholesale inventories have been rising only marginally but have still been well ahead of wholesale sales which have been falling. The stock-to-sales ratio in January rose two notches to 1.35 from 1.33 for the highest reading of the recovery, since April 2009. Forecasters see wholesale inventories turning lower in the February report, down a consensus 0.2 percent. Inquiring minds no doubt wish to see what the wholesale inventor-to-sales improvement looks like. Wholesale sales were an absolute disaster. That explain the insignificant but “welcome” improvement in the inventory-to-sales ratio above. I have been saying for quite some time as soon as autos roll over, a recession hits. Is this it?